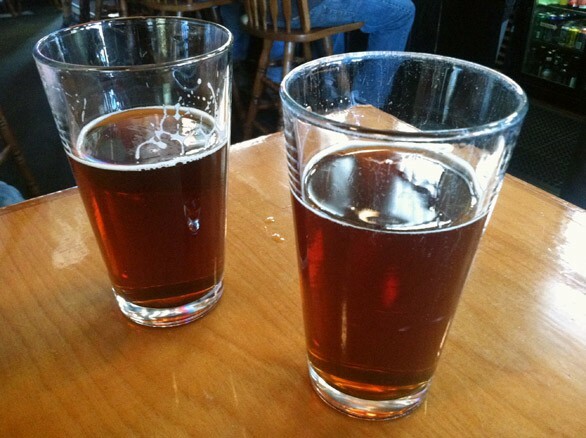 Two delicious pints of River City Red at The Elk last weekend. It took a little longer than expected, but River City Brewing is finally ready to fill our pint glasses. After setting up in Spokane, the reincarnated Coeur d'Alene Brewing Company hoped to have kegs out last fall — that didn't happen, but it was worth the wait. The brewery started distributing in mid-February, with its first appearance at Famous Ed's on the South Hill. Other restaurants and bars have been quick to follow, and it’s finally to the point where you can run into one of their beers on tap without seeking it out. This past weekend I got a chance to try the River City Red and the IPA for the first time, and both are solid additions to our local beer lineup. There are certain high expectations for a Northwest IPA these days, and River City meets them by putting the region’s excellent hops front-and-center without any unnecessary frills. The red makes no secret of its malty Scotch ale heritage, which is by no means a bad thing, and it goes down way too easy. A few old favorites from the Coeur d’Alene Brewing era like the Huckleberry Ale and Vandal Gold made their re-debut last month at the Moscow Alehouse — formerly an outpost under the Coeur d’Alene Brewing Company name — and the brewery’s website also lists a carefully crafted description for the VB Stout. Ha ha. Hopefully the forward-thinkers at River City won’t mind if this chick sticks with the red, because I’m just not really into golden ales, or woman jokes, frankly. But all that really matters is that they put out a good brew, right? Shut up and make me a beer, River City! UPDATE: River City Brewing contacted us to clarify that the quote above doesn't convey that they also dislike the term "chick beer." We had a good exchange on Twitter that you can read here. UPDATE 2: River City Brewing posted a thoughtful response about Golden Girlfriend on their blog that also gives some really nice background on the name and the style, and why serious drinkers shouldn’t be so quick to dismiss lighter beers.